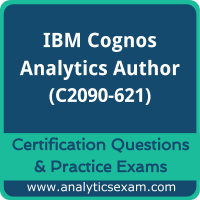 The sample exam has basic C2090-621 questions related to IBM Cognos Analytics Author Certification; you may find scenario based questions in your IBM Cognos Analytics Author V11 Certification exam which needs more dedication and attentions to understand each question. That is why we strongly recommend you to practice with our premium IBM Certified Designer - IBM Cognos Analytics Author V11 Certification practice exam. Why should you choose us for IBM C2090-621 practice exam? Our online practice exam is a simulation of IBM Cognos Analytics Author (C2090-621) Certification exam which allows you to complete within the time limit. We offer an unlimited attempt to practice our online exam. Each exam will fetch random questions from our 96+ most probable premium questions set prepared by our experts. You can view your result of each exam and performance history of your past attempts. Such facilities are a great advancement over C2090-621 questions set in PDF and far better than fraud dumps sites. According to our survey with certified candidates, you can easily score 85% in your IBM Cognos Analytics Author V11 Certification if you can score 100% in our online mock exams. 2. The site has the best interface, even if you use it from the mobile. 3. Marking and result feature is one of the best help, I feel. Tons and tons of resources were researched and analysed by my group of friends. But we did not find anything useful. Then someone gave me the link of this site. It has something that no other resources provided - personalization. I purchased practice exam for IBM C2090-621 and received result history and my performance. I could analyse how well did I at the subject mock tests and strategize further attempts. This is good, actually!! Passed the Cognos analytics author v11 with the great great help from this web's premium practice exam. I can now understand, why thsi site call it premium, as this is really a premium exam in all aspect. The question for C2090-621 are up to date and got correct answers. Overall, I liked it very much! Questions on this test is the same what I faced in the certification exam for the IBM cognos analytics author V11. One can rely on this web for IBM Cognos certification. Pass the IBM Cognos analytics authot V11 today. Thank you for the good practice questions. Happy to share my result of IBM Cognos analytics author V11_C2090-621, I scored 92%. The question I faced in final exam at Pearson test center were what I already practiced here and I know how to deal with it. The exam was super smooth. Thank you www.analyticsexam.com, you guys are the true savior for me. Questions were same in the certification exam for C2090_621. works fine on my Tab as well. There is no need to run from pillar to post to find the latest IBM Cognos Analytics Author V11 certification exam questions. You can find everything on this site. Yes, friends, this site is very genuine and very helpful to everyone who is serious to working to get certified on C2090-621. I was able to crack this exam only I come to know my weak areas and I improved on the same. There are currently 50 users and 341 guests online.